The IDF World Dairy Situation 2018 report was launched at the World Dairy Summit in Daejeon, Korea, on 16 October. It was put together by IDF experts from dairy producing countries around the world under the scope of work by the IDF Standing Committee on Dairy Policies and Economics (SCDPE). “The IDF World Dairy Situation 2018 will further your understanding of the current macro supply and demand trends affecting the dairy sector,” said Gilles Froment, Chair of the IDF Standing Committee on Dairy Policies and Economics. The 200-page flagship publication of the International Dairy Federation provides an overview of the dairy sector in over 50 countries around the world. The annual publication offers useful insight on macro supply and demand trends in the dairy sector with data on global milk production and processing, pricing, consumption and trade. * Milkfat-driven recovery of the market resulted in profitable milk prices throughout most of 2017, propelling above-average milk production growth last year. The strongest growth was recorded in India, Pakistan, Turkey, Australia, Poland and the United Kingdom. * There was greater import demand by China last year due to a shortfall in milk production. The East Asian country regained much of its strength as the No.1 dairy importer in the world after local stock positions normalised in 2016. The demand growth is in UHT milk, Mozzarella and cream cheese. * Key export regions like Oceania, the US and the EU will see their cheese production grow in years to come as they have to keep up with accelerating import demand in Asia, with Japan, the Republic of Korea and China being important destinations. IDF Director General Caroline Emond said the World Dairy Situation 2018 provides an informative outlook on the dairy sector. 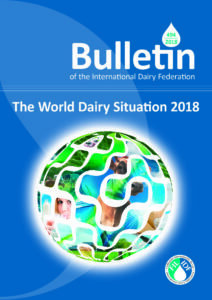 The World Dairy Situation 2018 was produced by a team from ZuivelNL and CNIEL. The publication is available at the IDF booth at the World Dairy Summit 2018 in Daejeon, and online at IDF Store.